Democracy Now’s parent station, Pacifica Radio, has apparently been funded by the Ford Foundation – a CIA front. When Mike and I were hiking around in the Arboretum a few months ago (the same day I fell off a cliff), we discovered a man-made shelter of sorts, hiding well off any trails. Yesterday, I went back there alone and took photos, along with some video and commentary for all to enjoy. Of course, I’m not going to say exactly where it is – I don’t want it to be destroyed – but, if you ask me, I’ll take you there. Sometime in the spring, I may try to spend a few nights there. This post was published on 2006-01-28 . It was modified on 2012-09-15 . When I first received Laurence Gonzales’ Deep Survival: Who Lives, Who Dies, and Why, I expected it to be a dry survival manual – specific solutions to specific situations. After the few few pages of the book, my expectations were quickly shot to the ground and the book managed to raise itself to the status of one of the best books I’ve ever read. Rather than dry disaster reports and analysis, I found the book to be part brain science, part stoic philosophy, and part zen teachings. It is a survival manual, but not like anything you expect. I highly recommend it to anyone, regardless of your interest in wilderness, as, more than anything, it’s a book about how to live. This post was published on 2006-01-27 . It was modified on 2012-12-22 . It was tagged with review, books, survival. A provision in the “Patriot Act” creates a new federal police force with power to violate the Bill of Rights. You might think that this cannot be true as you have not read about it in newspapers or heard it discussed by talking heads on TV. The new police are assigned a variety of jurisdictions, including “an event designated under section 3056(e) of title 18 as a special event of national significance” (SENS). “A special event of national significance” is neither defined nor does it require the presence of a “protected person” such as the president in order to trigger it. Thus, the administration, and perhaps the police themselves, can place the SENS designation on any event. Once a SENS designation is placed on an event, the new federal police are empowered to keep out and to arrest people at their discretion. The language conveys enormous discretionary and arbitrary powers. What is “an offense against the United States”? What are “reasonable grounds”? The obvious purpose of the act is to prevent demonstrations at Bush/Cheney events. However, nothing in the language limits the police powers from being used only in this way. Like every law in the US, this law also will be expansively interpreted and abused. It has dire implications for freedom of association and First Amendment rights. We can take for granted that the new federal police will be used to suppress dissent and to break up opposition. The Brownshirts are now arming themselves with a Gestapo. Many naive Americans will write to me to explain that this new provision in the reauthorization of the “Patriot Act” is necessary to protect the president and other high officials from terrorists or from harm at the hands of angry demonstrators: “No one else will have anything to fear.” Some will accuse me of being an alarmist, and others will say that it is unpatriotic to doubt the law’s good intentions. By Stalin’s time Lenin and Trotsky had eliminated all members of the “oppressor class,” but that did not stop Stalin from sending millions of “enemies of the people” to the Gulag. Title 18, Part II, Chapter 203, Sec. 3056. This post was published on 2006-01-25 . It was modified on 2012-09-15 . There’s a good interview of Chomsky over at Seattle Weekly, by local reporter Geov Parrish. Chomsky discusses our current one party system, the war on terror, and the current administration’s policies. They’re not stupid. They know that they’re increasing the threat of a serious catastrophe. But that’s a generation or two away. Who cares? There’s basically two principles that define the Bush administration policies: stuff the pockets of your rich friends with dollars, and increase your control over the world. Almost everything follows from that. If you happen to blow up the world, well, you know, it’s somebody else’s business. Stuff happens, as Rumsfeld said. Over at The Alternative Press Review, there’s a transcript of Chomsky’s lecture, “War on Terror”. To take one of these official definitions, terrorism is "the calculated use of violence or threat of violence to attain goals that are political, religious, or ideological in nature...through intimidation, coercion, or instilling fear," typically targeting civilians. The British government's definition is about the same: "Terrorism is the use, or threat, of action which is violent, damaging or disrupting, and is intended to influence the government or intimidate the public and is for the purpose of advancing a political, religious, or ideological cause." These definitions seem fairly clear and close to ordinary usage. There also seems to be general agreement that they are appropriate when discussing the terrorism of enemies. But a problem at once arises. These definitions yield an entirely unacceptable consequence: it follows that the US is a leading terrorist state... ... What about the boundary between terror and resistance? One question that arises is the legitimacy of actions to realize "the right to self-determination, freedom, and independence, as derived from the Charter of the United Nations, of people forcibly deprived of that right..., particularly peoples under colonial and racist regimes and foreign occupation..." Do such actions fall under terror or resistance? ... There are other such examples. We might want to bear them in mind when we read Bush II's impassioned pronouncement that "the United States makes no distinction between those who commit acts of terror and those who support them, because they're equally as guilty of murder," and "the civilized world must hold those regimes to account." This was proclaimed to great applause at the National Endowment for Democracy, a few days after Venezuela's extradition request had been refused. Bush's remarks pose another dilemma. Either the US is part of the civilized world, and must send the US air force to bomb Washington; or it declares itself to be outside the civilized world. The logic is impeccable, but fortunately, logic has been dispatched as deep into the memory hole as moral truisms. This post was published on 2006-01-24 . It was modified on 2012-09-15 . There’s plenty of controversy surrounding the series of books, of which The Teachings of Don Juan is the first, but I really don’t see why it matters if Don Juan was a real person, or whether he was created as a medium for the book’s message – or whether Castenada simply hallucinated the whole thing. The books explores many interesting ideas, many of which would do good to be considered by people today. Don Juan’s personification of not only the plants mentioned in the book, but also non-living objects, such as his pipe, have been imprinted on my mind. Regardless of whether you honestly suscribe to the indigineous way of thinking – that, in Don Juan’s case, the peyote plant is actually a teacher named Mescalito with various human characteristics – it is undeniably a healthy way of living. I look forward to continuing Castaneda’s series. This post was published on 2006-01-23 . It was modified on 2012-12-22 . It was tagged with review, books. I’m heading up to Baker in a couple hours and spending the night for an Avalanche Awareness course. I already have plenty to say about it (the lecture portion was last night), but no time to write it down. I should be back Saturday night around 8-9PM. In unrelated news: Check out In the Wake’s latest blog post (“Coming up on In the Wake”) for the questions I sent in a couple days ago. This post was published on 2006-01-20 . It was modified on 2012-09-15 . What I want is for civilization to stop killing my people’s children. If that can be accomplished peacefully, I will be glad. If signing a petition will get those in power to stop killing Indian children, I will put my name at the top of the list. If marching in a protest will do it, I will walk as far as you want. If holding a candle will do it, I will hold two. If singing protest songs will do it, I will sing whatever songs you want me to sing. If living simply will do it, I will live extremely simply. If voting will do it, I will vote. But all those things are allowed by those in power. And none of those things will ever stop those in power from killing Indian children. They never have and they never will. Given that my people’s children are being killed, you have no grounds to complain at whatever means I use to protect the lives of my people’s children. And I will do whatever it takes. This is a subject that Vavrek and I were mulling over a while ago, in relation to Sean‘s statement that “Ideology will not stand against the Truth”. Initially, I agreed with Vavrek about there being no absolute truth – that it’s all subjective reality. I have no reason to think that my idea of freedom or any of my ideals are any more correct than anyone else’s (Contradiction? The reason I’m against sean’s new path is because I feel that my ideal of not forcing others into my culture is somehow superior than his ideal of forcing his version of freedom). This is the same justification I have against violence. What right do I have to say that another man should die – or be locked away in a nut house – because he thinks or acts differently than I? Yet now, I do think there is some kind of Truth out there. I think we all agree on the same utopian ideal of a peaceful, sustainable, comfortable existence. Vavrek “still maintain[ed] that truth is inseperable from a point of view. Everything is connected.” He continued, saying “the great mistake of our recent past was the imaginary division of all things into individual parts. It came with the invention of the clock, thinking that everything works in seperate gears and wheels. On the surface, it just might seem this way. You can’t see anything without the seer.” He disagreed with my idea that we all have the same end in mind. Bringing this back to the ends or the means, I continued my train of thought on Sean’s statement. I disagree with Sean in that I no longer believe that the ends justifies the means. The path you take to this ideal is equally, if not more so, important as the end, because the end is just that – an IDEAL. As such, I believe it’s unattainable. We’ll not reach it in this lifetime, nor in one hundred. You can kill people for the Truth all you want, but, at the end of the day when you’ve not attained the unattainable, what have you done? Killed people. For nothing. After listening to Derrick’s interview, I’m rethinking it all over again. It’s obiovus that his idea of the end is more practical and reality based than my abstract concept. Partly because of this, I think our two ideas are compatible. The ends is equally important as the means. This post was published on 2006-01-16 . It was modified on 2012-09-15 . It was tagged with quote. The problem isn’t anonymity; it’s accountability. If someone isn’t accountable, then knowing his name doesn’t help. If you have someone who is completely anonymous, yet just as completely accountable, then – heck, just call him Fred. EBay’s feedback system doesn’t work because there’s a traceable identity behind that anonymous nickname. EBay’s feedback system works because each anonymous nickname comes with a record of previous transactions attached, and if someone cheats someone else then everybody knows it. This post was published on 2006-01-12 . It was modified on 2012-09-15 . When I came back from Vancouver last Sunday, I discovered a package waiting for me. It was a poster of Alex Grey‘s Wonder. Wonder, beyond being a stunning piece of art, holds special significance for me. 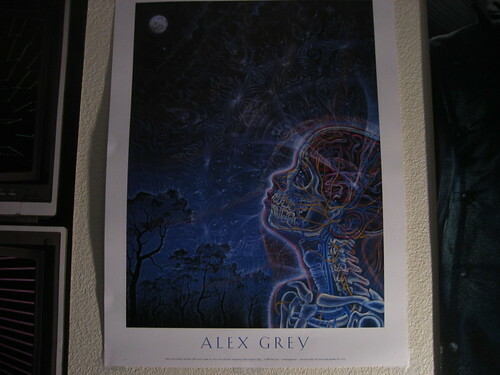 When I first saw it as the backdrop for the MutantFest flyer that Crimethinc sent me a couple years ago, it was not only the first of Alex Grey’s work that I had seen. It was the first time I’d heard of The Autonomous Mutant Festival, which introduced me to the idea of the T.A.Z., “a harmonious relationship with the earth”, and many of the other memes that shape my life. This post was published on 2006-01-10 . It was modified on 2012-09-15 . Tonight I’m heading back down south to pick up Nick. He’s spending the night here in Bellingham and, tomorrow, we’re taking the train up to Vancouver, B.C. for the Rant Meet, to celebrate RantMedia’s seventh birthday. We’ll both be in Vancouver from 11:40AM on Saturday till 6:00PM on Sunday and only have plans Saturday night, so if you’re in the area or have suggestions for entertainment, you should email me (no later than tonight), call me (if you have the number), or email my phone (mobile@pig-monkey.com – short messages only). We’re staying in a hostel on Granville Street. Due to a mudslide eight miles south of Edmonds, which blocked BNSF Railway-owned track, BNSF Railway has halted rail traffic through this Saturday evening. As a result, Amtrak trains between Seattle and Vancouver, B.C., is being represented by substitute bus service. The temporary bus substitution represents Amtrak Cascades trains 510, 513, 516 and 517, which operate between Seattle, Bellingham, Wash. and Vancouver, B.C. Intermediate stations affected are Edmonds, Everett and Mount Vernon. The Seattle-Chicago Empire Builder will originate and terminate in Edmonds, with substitute bus service between Seattle and Edmonds. Dear Amtrak Customer, Thank you for your inquiry. Knives or weapons of any kind are prohibited on Amtrak. We hope this information will be helpful. Sincerely, Brooke Amtrak Customer Service TRACKING NUMBER: A00000718100-00002723184 -----Original Message----- From: pm@pig-monkey.com Sent: 28 Dec 05 18:51:12 To: Cc: Subject: General Inquiries Name: Amtrak Customer Email: pm@pig-monkey.com Address1: Address2: City: State: Zip/Postal: Country: United States Phone Number: Subject: General Inquiries Message: What is your policy on pocket knives and multitools with blades under 3.5" on the train? This post was published on 2006-01-06 . It was modified on 2012-09-15 . If the truth can be told so as to be understood, it will be believed. Human history represents such a radical break with the natural systems of biological organization that preceded it, that it must be the response to a kind of attractor, or dwell point that lies ahead in the temporal dimension. Persistently Western religions have integrated into their theologies the notion of a kind of end of the world, and I think that a lot of psychedelic experimentation sort of confirms this intuition, I mean, it isn't going to happen according to any of the scenarios of orthodox religion, but the basic intuition, that the universe seeks closure in a kind of omega point of transcendence, is confirmed, it's almost as though this object in hyperspace, glittering in hyperspace, throws off reflections of itself, which actually ricochet into the past, illuminating this mystic, inspiring that saint or visionary, and that out of these fragmentary glimpses of eternity we can build a kind of map, of not only the past of the universe, and the evolutionary egression into novelty, but a kind of map of the future, this is what shamanism is always been about, a shaman is someone who has been to the end, it's someone who knows how the world really works, and knowing how the world really works means to have risen outside, above, beyond the dimensions of ordinary space, time, and casuistry, and actually seen the wiring under the board, stepped outside the confines of learned culture and learned and embedded language, into the domain of what Wittgenstein called "the unspeakable," the transcendental presence of the other, which can be absanctioned, in various ways, to yield systems of knowledge which can be brought back into ordinary social space for the good of the community, so in the context of ninety percent of human culture, the shaman has been the agent of evolution, because the shaman learns the techniques to go between ordinary reality and the domain of the ideas, this higher dimensional continuum that is somehow parallel to us, available to us, and yet ordinarily occluded by cultural convention out of fear of the mystery I believe, and what shamans are, I believe, are people who have been able to de-condition themselves from the community's instinctual distrust of the mystery, and to go into it, to go into this bewildering higher dimension, and gain knowledge, recover the jewel lost at the beginning of time, to save souls, cure, commune with the ancestors and so forth and so on. Shamanism is not a religion, it's a set of techniques, and the principal technique is the use of psychedelic plants. What psychedelics do is they dissolve boundaries, and in the presence of dissolved boundaries, one cannot continue to close one's eyes to the ruination of the earth, the poisoning of the seas, and the consequences of two thousand years of unchallenged dominator culture, based on monotheism, hatred of nature, suppression of the female, and so forth and so on. So, what shamans have to do is act as exemplars, by making this cosmic journey to the domain of the Gaian ideas, and then bringing them back in the form of art to the struggle to save the world. The planet has a kind of intelligence, that it can actually open a channel of communication with an individual human being. The message that nature sends is, transform your language through a synergy between electronic culture and the psychedelic imagination, a synergy between dance and idea, a synergy between understanding and intuition, and dissolve the boundaries that your culture has sanctioned between you, to become part of this Gaian supermind, I mean I think it's fairly profound, it's fairly apocalyptic. History is ending. I mean, we are to be the generation that witnesses the revelation of the purpose of the cosmos. History is the shock wave of the eschaton. History is the shock wave of eschatology, and what this means for those of us who will live through this transition into hyperspace, is that we will be privileged to see the greatest release of compressed change probably since the birth of the universe. The twentieth century is the shudder that announces the approaching cataracts of time over which our species and the destiny of this planet is about to be swept. If the truth can be told so as to be understood, it will be believed. The emphasis in house music and rave culture on physiologically compatible rhythms and this sort of thing is really the rediscovery of the art of natural magic with sound, that sound, properly understood, especially percussive sound, can actually change neurological states, and large groups of people getting together in the presence of this kind of music are creating a telepathic community of bonding that hopefully will be strong enough that it can carry the vision out into the mainstream of society. I think that the youth culture that is emerging in the nineties is an end of the millennium culture that is actually summing up Western civilization and pointing us in an entirely different direction, that we're going to arrive in the third millennium, in the middle of an archaic revival, which will mean a revival of these physiologically empowering rhythm signatures, a new art, a new social vision, a new relationship to nature, to feminism, to ego. All of these things are taking hold, and not a moment too soon. This post was published on 2006-01-05 . It was modified on 2012-09-15 . It was tagged with quote. Go now. Watch Shamans of the Amazon. The documentary (briefly) covers a variety of topics, such as the evils of oil companies in Ecuador, but focuses mainly on Ayahuasca use by the indigenous shamans of the Amazon. This post was published on 2006-01-05 . It was modified on 2012-09-15 . I made it back up north. We have new bathroom stalls. This post was published on 2006-01-02 . It was modified on 2012-09-15 . A while back, we used to run an image gallery with over 5,000 pictures of all types. During this time, more and more web sites would inline link to the images. Inline linking means the image would display on their page, as if it was their own or hosted on their own server. This caused the image to display fine, but be served up by our server and use our bandwidth. Early on, gallery traffic was responsible for a couple gigs of traffic, but quickly grew. After a couple months, this got to be quite a burden to this server and our hosting situation. On a normal day, we would push out over 10 gigs of traffic from the gallery alone, often enough to saturate the link during peak hours. In the past 48 hours (29th/30th), there have been just under 20,000 link attempts from 928 profiles! If you would like to cause yourself physical discomfort, feel free to wade through a list of the profiles that have partaken in the abuse. I warn you, many of these are physically nauseating and make grown men cry due to the “terrible grammar, horrible page formatting, and annoying graphics” as Rick Forno once said. When you hear people talk of online communities such as myspace.com, remember that they are not some fabulous social network advancing our culture. They are the scum of the internet, dragging it further down the sewers day by day. They are full of the most shallow, vapid and weak minded people our society has to offer. They are the next generation, and that scares me. Think about how much you’ve grown the past year. Books read, experience gained. I enjoy the new year. Expand your mind. Question authority. Expand your consciousness. Question reality. This post was published on 2006-01-01 . It was modified on 2012-09-15 .